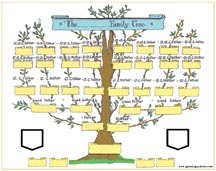 An ancestor Family Tree Chart. What a wonderful way to show off your family history, or an ideal gift for one of your relatives. A Direct Ancestor Chart back to Gt. Gt. Grandparents all direct ancestors of the source person can be recorded on it, Parents, Grandparents & Gt. Grandparents and up to 4 children. 2 printed shields that can be used to contain small photos. Actual chart size, 17 x 14 inches. Sent to you free from creases & rolled in a cardboard tube with plastic end caps. P&P is included in the price for U.K. customers only.